This document was originally written in January of 1995 to accompany an entry into the arts and sciences exhibition at an event of the Society for Creative Anachronism, Inc.--the East Kingdom Twelfth Night. It has been edited slightly, mostly for grammar. 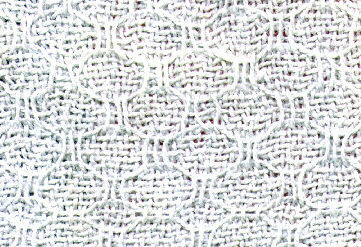 This sample, designed to be used as a napkin, is based on a linen textile found in the tenth century level of the archaeological dig at Jorvík (York, England). It is woven in ramie, a species of nettle fiber, and was my first attempt at harness-weaving with a bast fiber. The original textile, Jorvík 1336, was a piece of linen woven in a type of honeycomb weave, called in German wabengewebe. Wabengewebes have been found in some early period sites dating to the seventh through tenth centuries in various northern Europe locations. Based on their find locations, the weave type is thought to be Alamannic, Bavarian, or possibly Frankish in origin (Bender Jørgensen, 145). The piece found at Jorvík was therefore most likely to have been an import. The original was woven with the same size yarn in both warp and weft, a single-spun flax yarn 0.8mm wide, and with equal numbers of ends and picks per centimeter (15). It is unusual as early period textiles go, because most of the surviving textured textiles of this period in North Europe are woven with warp and weft of differing size and closeness. In the Valsgärde publication the weave diagram is shown at right-angles to that in Fig. 146a.... This may be correct.... However, it seems to be technically simpler if woven the other way round, with only four different sheds necessary to make up the pattern. Walton seems not to have taken into account the main problem of her drawdown, which is that, unlike all other known loom-woven textiles originating in North Europe in this period, it would require five heddle rods to weave. After ascertaining that I could not weave Walton's drawdown on four harnesses, I turned Walton's drawdown on its side and was able to warp and weave it with no problem. (See my draft of the weave at the end of this work.) Based on this sample, I think Walton chose the incorrect orientation for her drawdown. The yarn content is different from the original; although nettle fiber was sometimes used for textiles in the Viking Age, it was a different species from the Filipino species used in my sample. Also, the original linen yarn was a singles yarn, not a plied yarn like I have used. That affects the degree to which the yarn spreads out; plied bast yarns flatten and spread less than singles. Even though the yarn I used is the same diameter as that used in the original piece, this piece further differs from the original by having only about 8 ends and picks per centimeter, half the number of the original. The original piece would have felt thicker and much more densely packed. The grey color of my yarn was commercially dyed, although dew-retted linen can also appear grey. I also added the red border, simply because gules is my color; the other two napkins from this sampler also have colored borders to suit their recipients. With its long absorbent warp floats, this weave is suitable for hand linens. Indeed, it is very similar to a modern huck weave. After I had redrafted the drawdown into something I could weave on four harnesses, I discovered Bender Jørgensen's book. Bender Jørgensen's drawdown of the weave (page 12) matches mine in orientation. I also subsequently located a modern-day version of this very weave (warp floats on a 2/1 twill background) in Marguerite Davison's A Handweaver's Pattern Book (page 82, "Huck-A-Back & Twill," II)! Bender Jørgensen, Lise. North European Textiles until AD 1000 . Aarhus, Denmark: Aarhus University Press, 1992. Davison, Marguerite Porter. A Handweaver's Pattern Book , rev. ed. Swarthmore, Penn. : Marguerite P. Davison, Publisher, 1944. Walton, Penelope. Textiles, Cordage and Raw Fibre from 16-22 Coppergate . The Archaeology of York, vol. 17, Fascicule 5. London: The Council for British Archaeology and the York Archaeological Trust, 1989. See also the works of Hans-Jürgen Hundt listed in my An SCA Handweaver's Bibliography for more references to wabengewebes. This page was created on 6 November 1997 and last updated on 29 April 1998.